It’s back to school time, which means it’s time to put my home lunch making apron on! 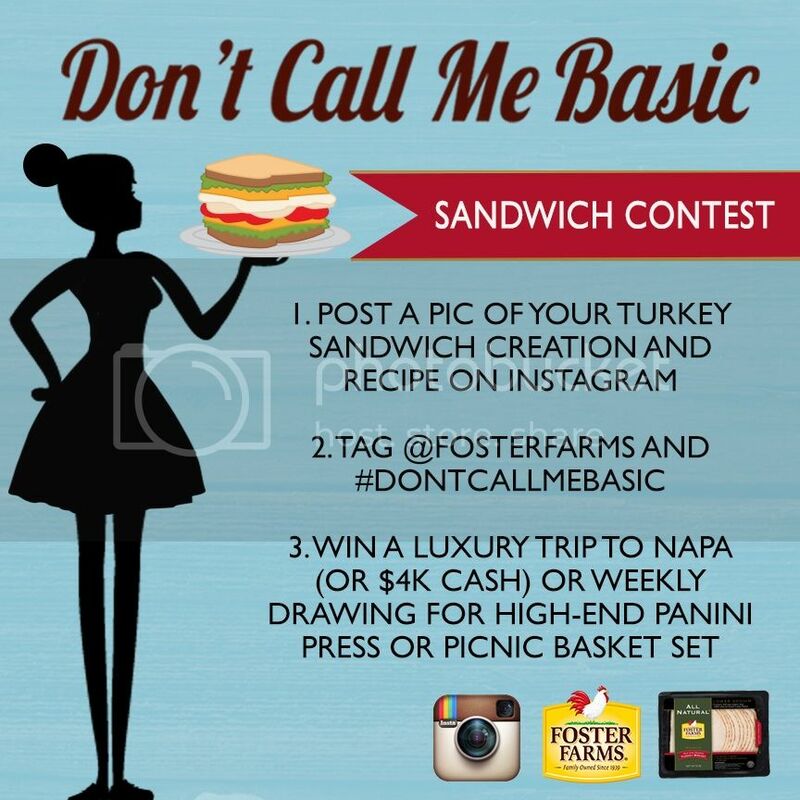 So when one of my favorite brands, Foster Farms, decided to sponsor this post to kick-off the Don’t Call Me Basic sandwich contest, I was beyond excited! I’ve been dying to create a buffalo wing inspired sandwich and knew this would be a fun challenge! Whenever I make a new sandwich for the kids, I always think about the things they like to eat. My kids love buffalo wings and grilled cheese sandwiches, so I thought it would be a great idea to combine the two flavors to make a Buffalo Turkey Waffleich.. Okay, I know you’re thinking…”What is a waffleich? !” Well, you can thank my youngest daughter for the name, but it’s my cheater way of speeding up the process to grill both sides of bread on a sandwich by tossing it into a waffle maker. I totally love saving time in the kitchen and the kids love the crispy crust and funky waffle markings. Now that we’ve defined what a waffleich is, let’s talk about the main ingredient to make a Buffalo Turkey Waffleich. A good sandwich starts with the quality of the lunchmeat. Since my kids bring lunch from home daily, they tend to eat a lot of sandwiches. It’s important to me to fill their sandwiches with lunchmeats that I feel good about. I love using Foster Farms All Natural Sliced Turkey in sandwiches because I know I’m feeding my family turkey that’s anything but basic. It’s all natural*, lower in sodium**, contains no chemicals or preservatives***, and comes from turkeys raised without hormones or steroids✝. Awesome, right? Before going to the market, I made sure to download the “Save a Dollar Now” Foster Farms coupon because who doesn’t love to save money? I was able to pick up all 8 ingredients for my Buffalo Turkey Waffleich and had it whipped up in under 20 minutes! Want to make this waffleich? Check out my recipe below. Do you have a super creative turkey sandwich recipe? Foster Farms is looking for the most creative turkey sandwich. Enter your creation in the Don’t Call Me Basic sandwich contest for your chance to win the grand prize of a luxury weekend getaway for two to the gorgeous Napa Valley or $4,000 cash! You’ll even be eligible to win weekly prizes from a random drawing – either a high-end panini press or gourmet picnic basket set – just for entering. Entries may also be emailed to dontcallmebasic@fosterfarms.com if participants don’t have an Instagram account. The grand prize includes a two-night stay for two at a Napa Valley luxury hotel, travel to/from and a gourmet picnic lunch ($4,000 value) or $4,000 cash prize. Random weekly drawings will be held every Friday to give all participants a chance to win. Prizes for the weekly drawings will include high-end panini presses or gourmet picnic basket sets. The contest will last the month of August (National Sandwich Month) and is open to all U.S. residents over the age of 18. Sandwich concoctions will be selected and judged by a panel of culinary and food industry professionals, who will identify five recipe finalists. The grand prize winner will be selected from the finalists by a panel of five food and lifestyle blogger judges. The winner will be announced in early September. An easy to assemble buffalo turkey sandwich made using the waffle iron- Buffalo Turkey Waffleich Sandwich. Mix together softened cream cheese and hot wing sauce. Spread onto one side of the four pieces of bread. Spread mayonnaise on the opposite side of the bread pieces. On two of the bread pieces, place the turkey, provolone, lettuce and ranch dressing on the side spread with the cream cheese mixture. Top with the remaining bread slices, ensuring the mayonnaise sides are facing out. Heat up the waffle iron. When ready, place one sandwich onto the waffle and press the waffle iron down. Toast until the outside bread is golden brown and crisp. Repeat for the second sandwich. Disclosure: This is a sponsored post written by me on behalf of Foster Farms All Natural Sliced Turkey. All opinions are my own. The contest is sponsored by Foster Farms. I am going to try this in my waffle maker – Thanks for linking up to Pin Worthy Wednesday, I have pinned your post to the Pin Worthy Wednesday Pinterest Board. OMG this is fantastic! I need to try this! Yum! Well that looks interesting! I’ve never thought of waffles with a filling. Thanks for sharing this with us at #AnythingGoes linkup and see you next week! This is such an awesome idea. The sandwich looks delicious, and I think my kids would love it. Thanks for sharing! Looks so yummy and easy! What a great idea! WOW so FUN! We don’t have a panini maker but my husband loves toasted sandwiches. Waffle maker – duh! He is also a big fan of buffalo wings/buffalo sauce so I know he will love this! Well, now, doesn’t that look so good!! Thanks so much for stopping by!! Waffle iron cornbread sounds yummy! You should take a picture of sandwiches and enter the contest 🙂 The Foster Farms All Natural Sliced Turkey meat is actually nice and thick for sliced meat and very satisfying. Hope you can find it. I wouldn’t mind a panini maker, but using the waffle maker is sort of close. The sandwich still gets a nice crisp outside…just with a waffle design…lol. Oh, and you should totally enter the contest. Thanks Kristen. I love using the waffle maker to “grill” the sandwiches. So quick and easy too. Now that sandwich is quite appetizing! I’m making plans now for sandwich night and breaking out the waffle iron! I love waffle iron cornbread so why we haven’t used it for sandwiches yet is beyond me! I’ll check for Foster Farms in our area too! What a fun contest and sandwich! I’ve always liked waffles for breakfast and now I can have a look-alike for lunch, too. That sandwich looks so good and I have never thought to use a waffle iron to make a sandwich. Who needs a panini maker? Goodness gracious, Erlene…that looks amazing! Such a good idea!